The American Kestrel is the smallest and most common falcon in North America. Unlike many other species of falcons, males and female kestrels have different plumages. Males have blue/gray upper wings coverts and the wing tips are black with white spots. The back is rufous with bars. The lower back only is barred in adults (upper back clear), while the back is completely barred on juveniles. The tail color is variable, but most are reddish, with a wide sub-terminal black band. The tips of the tail is white. Females have barred reddish brown backs and upper wings coverts. The wing tips are brownish without white spots. Tails are reddish brown with brown bands. Juvenile females are similar to adults. As noted in the Falcon photos page, American Kestrels are reverse size dimorphic, meaning that the females are larger than the males. The dimorphism is not nearly as pronounced for Kestrels as it is for some other falcons and Accipiters, so there is more overlap in size (weight and wing measurements) between male and female American Kestrels. 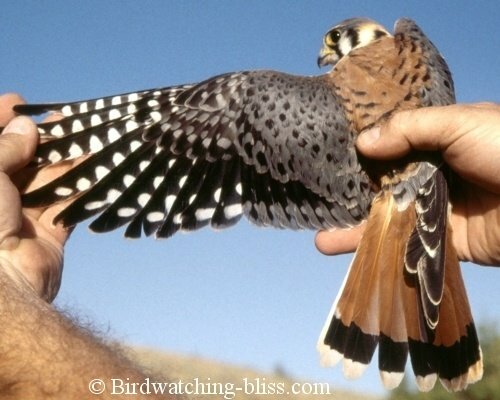 Some wing and weight data that we have collected are presented below for American Kestrels. **Raptors store food in a crop (pouch in the throat area). Food in the crop or stomach can effect the birds weight. We cannot know if there is food in the stomach, but we can estimate the amount of food in the crop. We score the crop on a 0 = no food in the crop to a 3 = full crop. American Kestrels are partially migratory. Some migrate South into Central America, while others spend the Winter in some very cold areas in the Northern U.S. and Southern Canada. Kestrels can be seen on migration at some very well known Raptor migration sites such as Hawk Mountain (Pa), Cape May Point (NJ) and many other sites. They are among the first raptors to begin migration. Bent, A.C. 1937. Life Histories of North American birds of prey. U.S. National Museum Bulletin. 167:106-121. 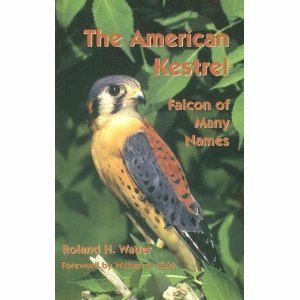 Wash. D.C.
Go to Raptor Migration - Learn where you can see 1000s of Kestrels during Fall Migration.